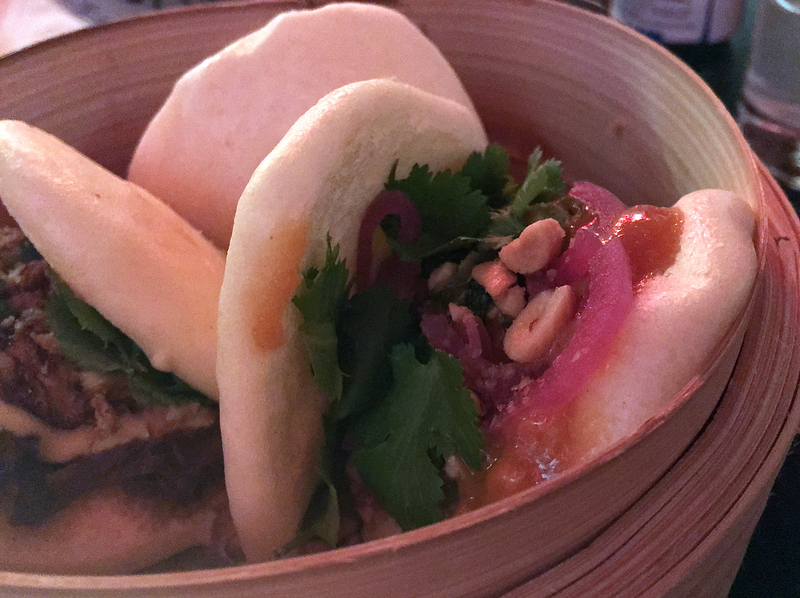 London has well and truly fallen for Taiwanese gua bao. From its early days as a street food favourite to the JKS-backed sensation that is Bao, restaurants serving these Taiwanese sandwiches have now opened in farther flung London boroughs such as Peckham and Tooting. There’s little sign of bao fatigue though, with the buns appearing at middle-class clammy lunch trough chain Pod and now – at the other end of the scale – Bao and Bing in Marylebone. 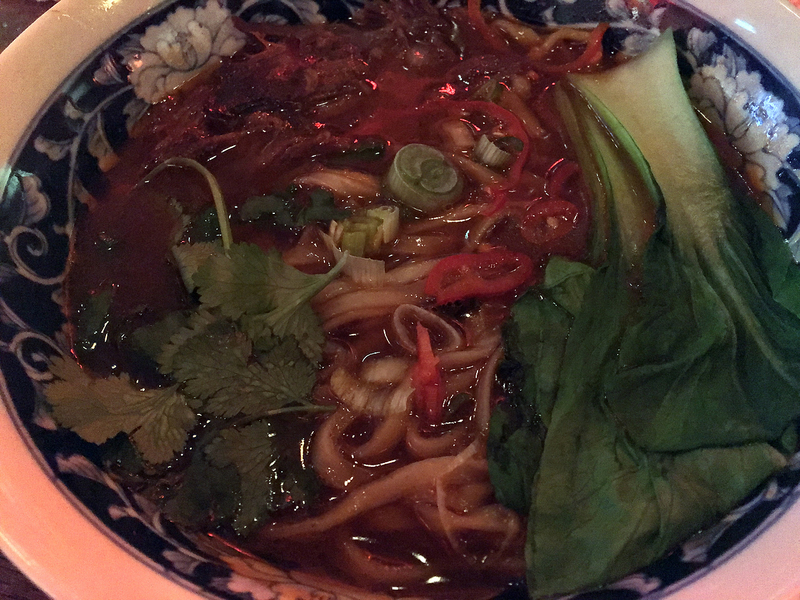 While Bao and Bing has all the usual gua bao on its menu, it tries to push the state of the art forwards by serving other Taiwanese dishes seldom seen in London – Taiwanese beef noodle soup and dan bing. 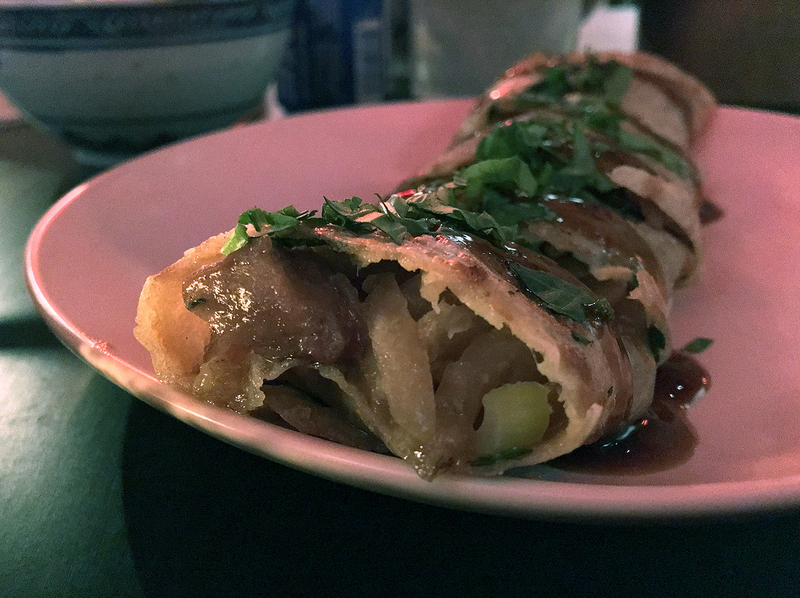 The latter, also known as popiah, are somewhat similar to jianbing. But these stuffed griddled pancakes are smaller and have been sliced horizontally so that they almost resembled stuffed cheung fun. While admirable, Bao and Bing’s attempts at diversification lead to decidedly mixed results. 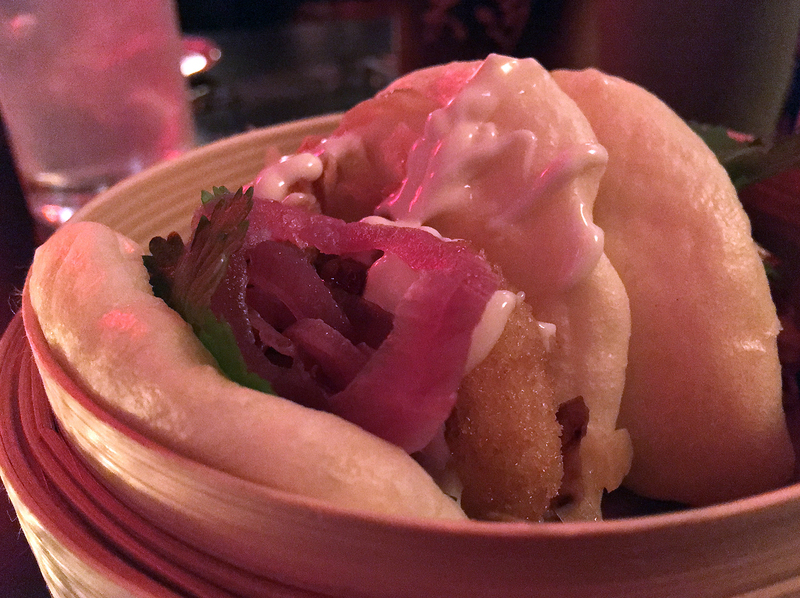 All of Bao and Bing’s gua bao used fluffy, pillowy buns. The problem lay not in the buns, but in the various fillings. 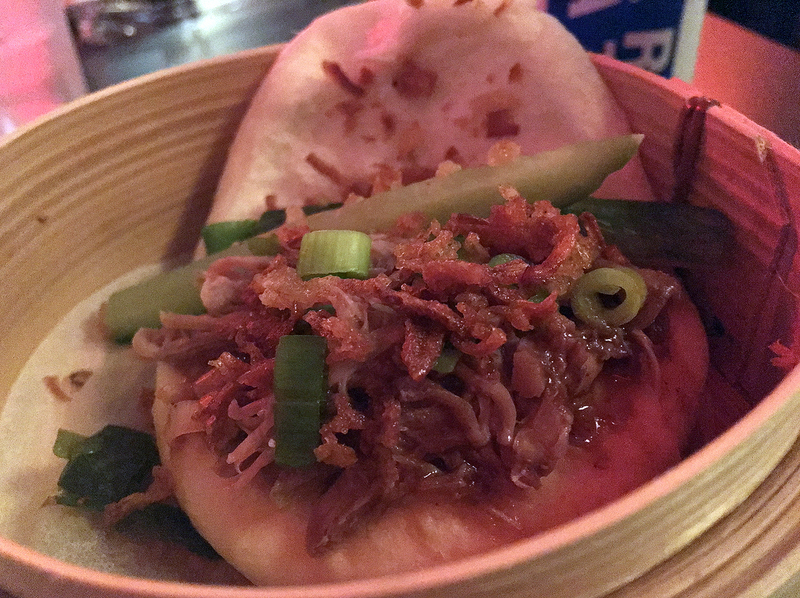 The meat used in the shredded crispy duck bao had little to say for itself, dominated as it was by the overwhelming umami of hoisin sauce with only some scattered veg to offset it. The variant filled with battered, deep-fried shrimp was somewhat better. Not because of the puny prawns, but because of the crunchy, moreish batter smeared with a peppery, spicy sauce. 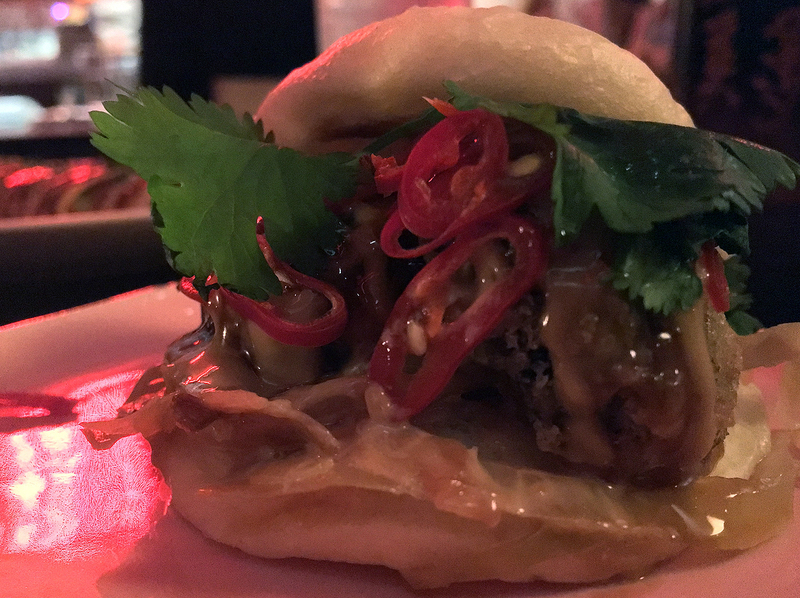 Both the pork belly and the chicken-filled bao were astonishingly dull, with only occasional hints of chilli spice and moreishness to prevent me from nodding off mid-mouthful. The five-spiced beef was far better. 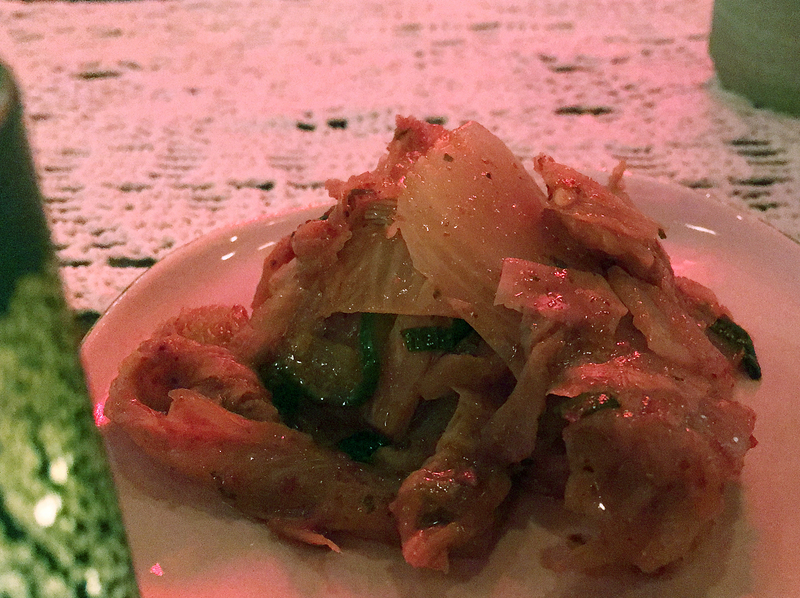 While it didn’t really succeed in replicating the nuanced depths of Chinese five-spice, its gentle warmth was still a good match for the sinewy strands of beef. 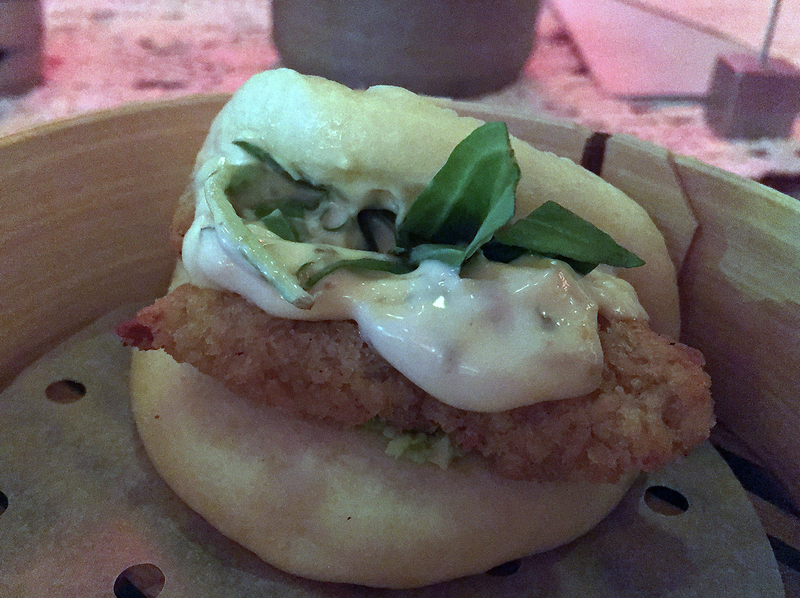 A hake bao from the specials board turned out to be a sort of hybrid between a Filet-o-fish and a takeaway fish supper. While the batter was crunchy and oil-free, the fish underneath was scanty and threadbare at best. The limp tartare sauce and mushy edamame brought little to the table. Ill-advised. but this wasn’t special at all. At best, it was mundane. The battered mushroom bao was, surprisingly, the best of the lot. The crunchy batter gave way to reveal moist, springy, earthy and meaty shiitake, all of which contrasted neatly with the fluffiness of the bun. The punchy heat of chilli sauce and the creaminess of kewpie-style mayo were neat finishing touches. 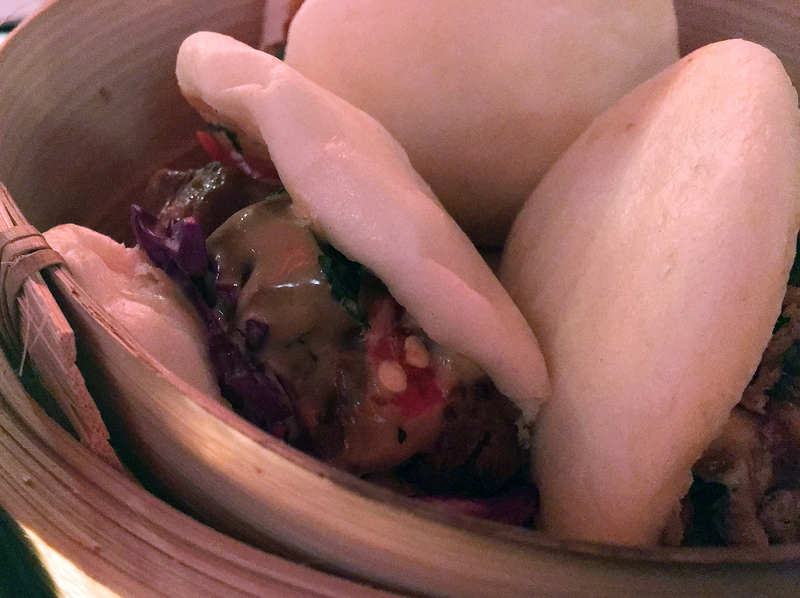 If only all of Bao and Bing’s gua bao were this good. The quality of the crepe used in the dan bing/popiah sliced pancake was surprisingly variable across my multiple visits. 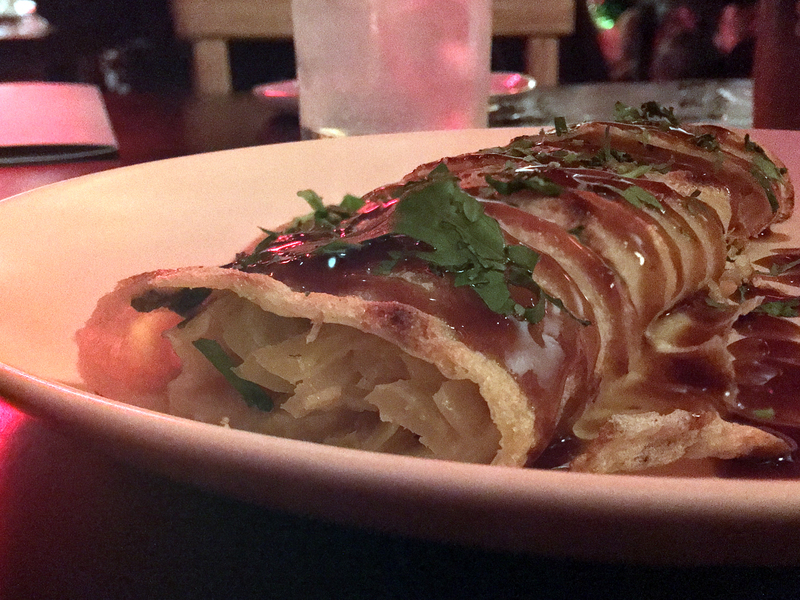 In the vegetarian version, the thin crepe was moist, slippery, soft and moreish. Although the veg was shrug-inducing, the crunchy wonton skins, umami hoi sin sauce and occasional squirt of hot sauce made for unexpectedly fine eating. The pork pancake, on the other hand, came in a harder, tougher crepe. The sauces were just as good as they were before, but the pork’s occasional flashes of dense meatiness and fattiness were frustratingly intermittent. 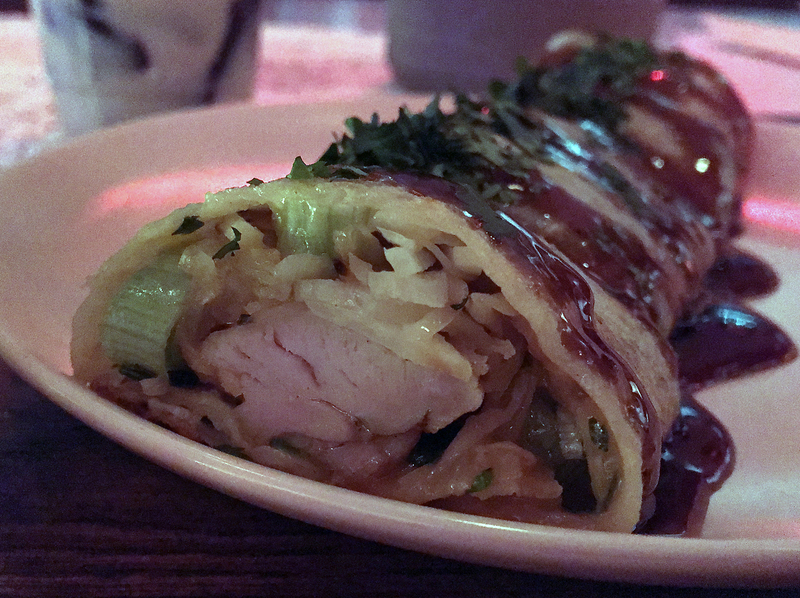 The chicken dan bing saw a return to a floppier crepe with an unexpected egginess that increased its resemblance to jianbing. The so-so chicken and vegetables were largely dependent on the sauces for flavour though. I had no quarrel with either the noodles or the protein in the beef noodle soup. The former were narrow, thick, supple and hearty, while the latter consisted of sinewy, hearty brisket-like flecks and shreds. It was the soup that let the side down with its one-note umami, leading to an over-dependence on the spring onions, coriander and occasional slice of chilli for depth of flavour. 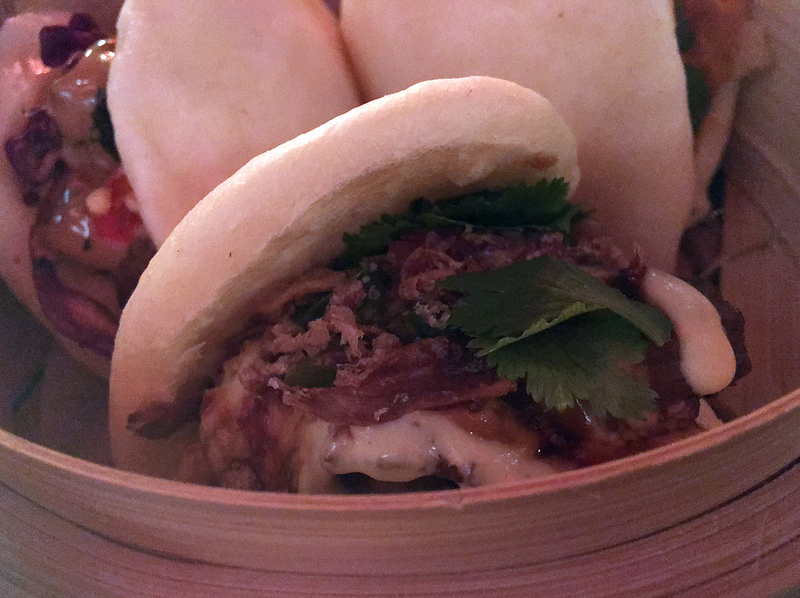 At Bao & Bing, you order by marking a tick-box sheet and then handing it to your waiter. 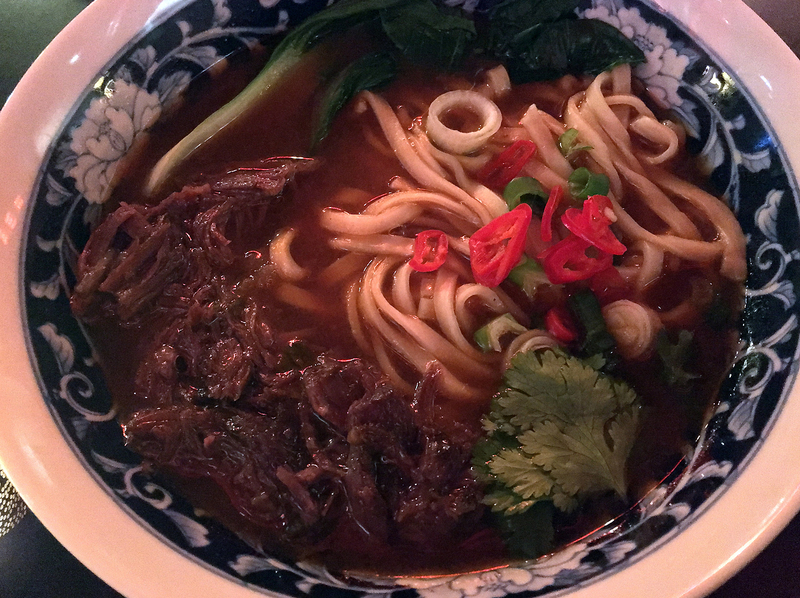 The beef noodle soup’s qualities remained unchanged over multiple visits. 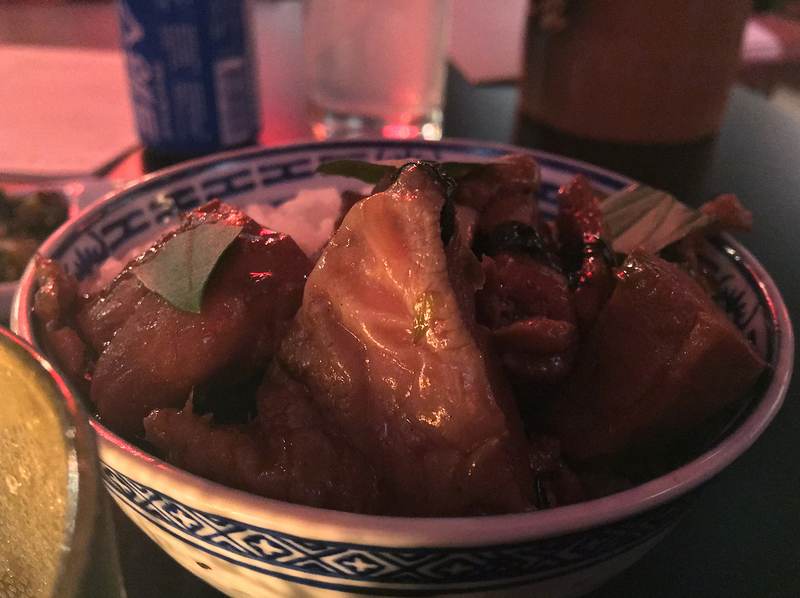 While the three cups chicken didn’t have the depth of flavour I’d expect from meat steeped in soy, rice wine and sesame oil, it wasn’t all bad. The tender chicken still had a reasonable level of moreishness, while the small-grained rice was respectably fluffy. Sour, tart and peppery kimchi was better than the kimchi I’ve had at some Korean restaurants. The fried chicken, on the other hand, was akin to a chicken nuggets meal for kids. Soft, moist and floppy on both the inside and the outside, the fried chicken wasn’t inedibly terrible. Just underwhelming, even when taken with the modestly citrusy mayo. Colour-correcting crimson-hued vegetables photographed under red neon lights is a tricky business. Nugg nuggs? Is that you? 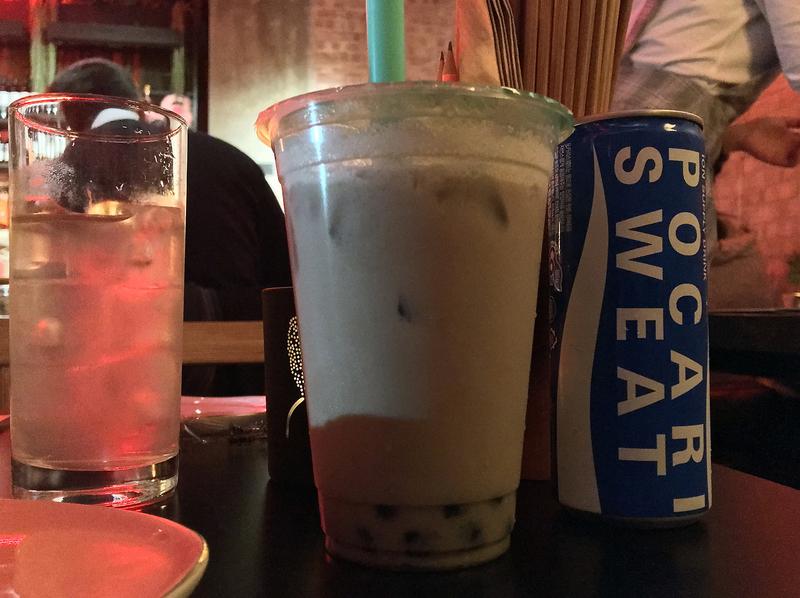 The amusingly-named Pocari Sweat is a Japanese sports drink that has a taste somewhere in between lemonade, tonic water and the medicinal rehydration fluid you drink when you’re recovering from a bad case of the runs. Ahem. Anyway, it’s not only refreshing but undemanding and I, for one, welcome its presence at Bao and Bing. 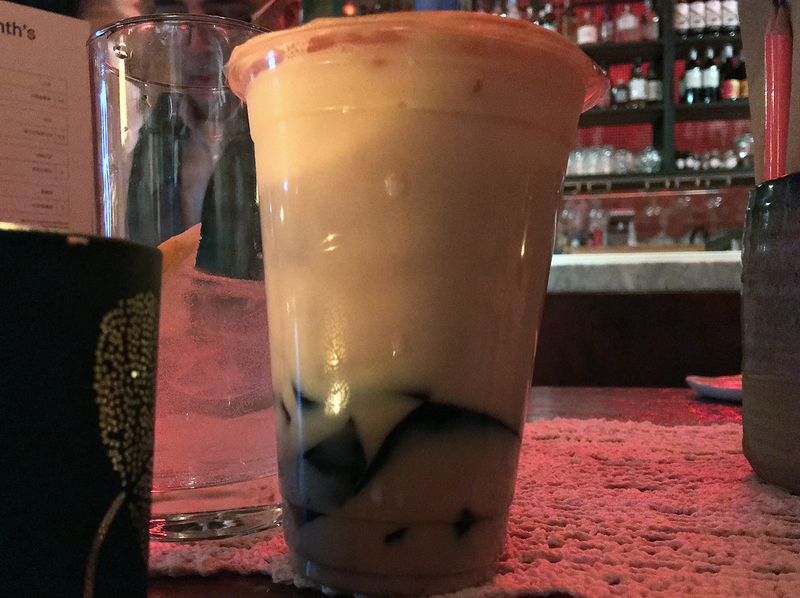 A variety of milk tea drinks, available either hot or cold, are available at Bao and Bing with a variety of toppings – including tapioca pearls to make a classic bubble tea. Taro-flavoured tea was sweet, starchy and refreshing; the sweet and springy tapioca pearls were a good fit. Assam milk tea with sago was less successful, resembling both coconut and soya which left a somewhat sickly and cloying impression. The smoky tannins of jasmine tea made it a natural fit for the sweet smoky richness of black glass jelly – a hearty yet refreshing combination. I forgot to photograph the assam milk tea with sago. Although given how iffy these beverage photos turned out, perhaps that’s no bad thing. Wheelcakes, also known by their Japanese name imagawayaki, is available with a variety of fillings including classic red bean. The vegetal sweetness of the red bean paste is an acquired taste; the cardboard-like pastry even more so. I’ve come to like the former, but I doubt the same will happen for the latter which makes it difficult to wholeheartedly recommend this dessert. Popiah pancake stuffed with ice cream was easily graspable with one’s fingers. The soft, thin crepe faded into the background, letting the smooth, refreshing if plain ice cream take centre stage. While the nuttiness of the crushed peanuts was welcome, the ice cream should really have been peanut butter flavoured for maximum effect. 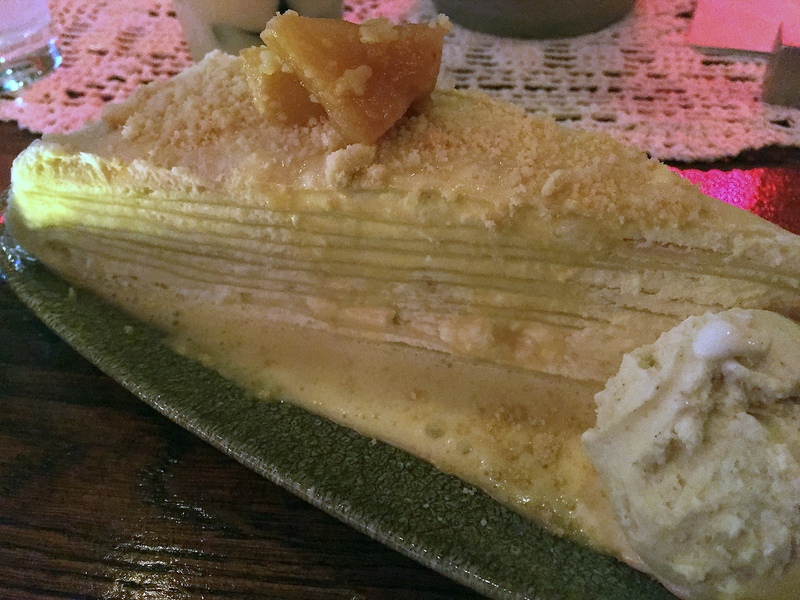 The millecrepe was a sumptuously rich, decadently corpulent dessert. Despite the menu’s description to the contrary, demolishing it is a two-person job. 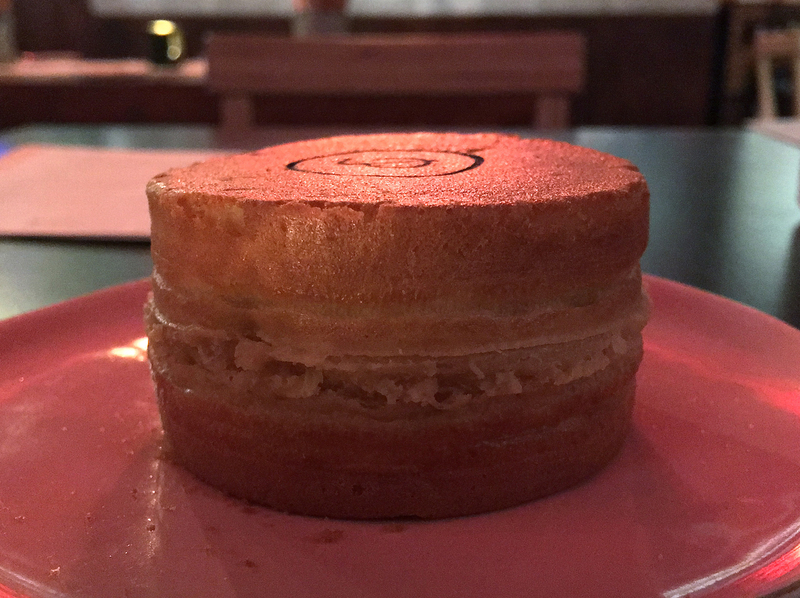 Under no circumstances should a single person attempt to devour it – this voluminous dessert was one of the very few dishes outside of the US to almost single-handedly satiate my otherwise voracious appetite. 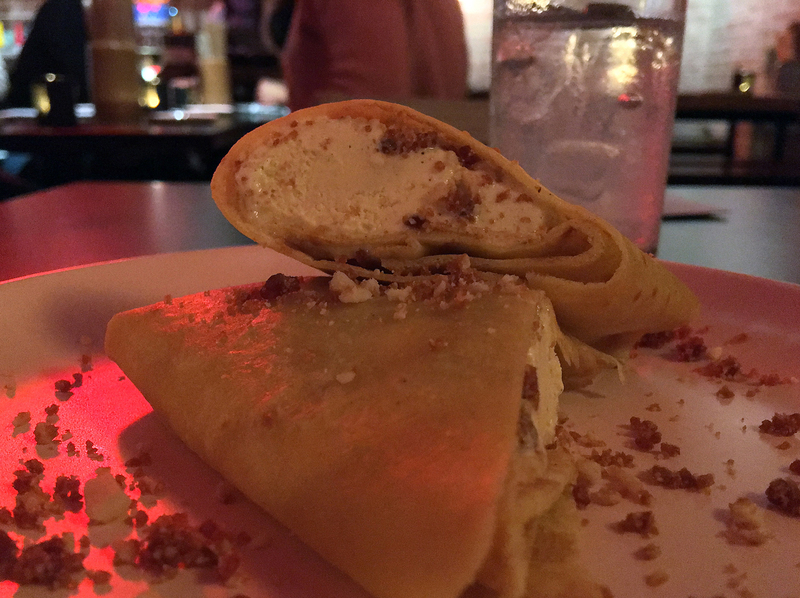 The lashings of velvety cream, the dense chewiness of the stacked crepes and the tangy candy-like sweetness of the pineapple jam interleaved between each crepe was almost overwhelmingly luxuriant. If you only order one dish at Bao and Bing, then make it this one. The pineapple jam was highly reminiscent of Chinese pineapple cake. There’s no denying that Bao and Bing is attractively decorated with its Formosan memorabilia atmospherically lit with both neon and candlelight. There’s also no denying that the service was generally friendly, welcoming and efficient. And it’s undeniably pleasing to see a Taiwanese restaurant in London attempting to popularise dishes from the island beyond gua bao, however tentatively and conservatively. But this restaurant’s good intentions haven’t been matched by effective execution, not when some of the best things on the menu are the millecrepe and the iced milk teas. These are fine accomplishments for a cafe, but a frail foundation for a restaurant. Perhaps one day Bao and Bing will succeed in broadening Londoners’ culinary horizons. That day seems far off though when it can’t given rustle up a slap-up gua bao dinner. Opening Hours: Monday-Friday 11.30-22.30. Saturday 10.00-22.30. Sunday 10.00-17.00. Average cost for one person including soft drinks: £35-50 approx. 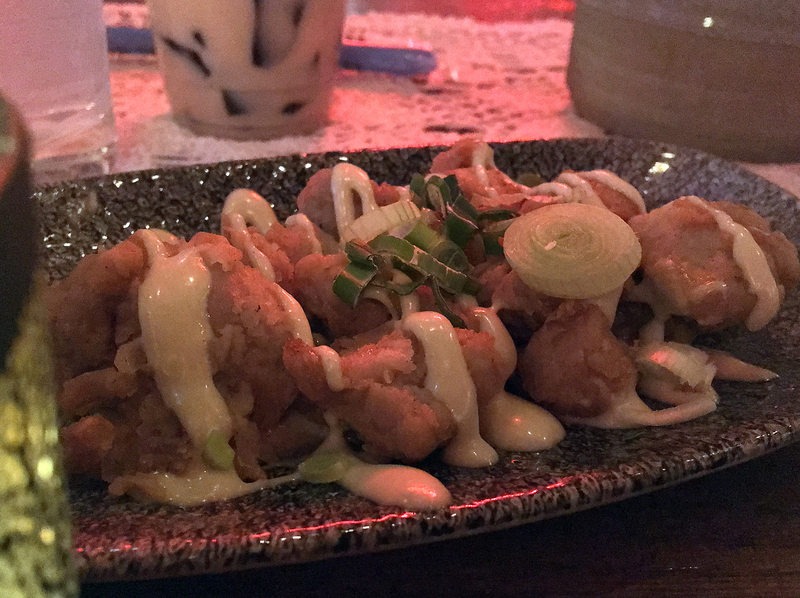 Tags: bao and bing, beef, bubble tea, chicken, crepe, dan bing, fish, fried chicken, gua bao, hake, ice cream, kimchee, kimchi, london, marylebone, millecrepe, mushroom, noodle soup, pancake, pork, restaurant, review. Bookmark the permalink.